Note: The plugin API is a work in progress and will likely change in the future. For most use-cases, Insomnia’s core feature set will suffice. However, for certain things like custom authentication mechanisms or complex workflows, more advanced behavior may be required. This document provides an overview of Insomnia’s plugin APIs, which can be used to extend the functionality of Insomnia. There are two general types of plugins that you can create for Insomnia. A plugin can either add a custom template tag for rendering custom values, or defined a hook which can do things like intercept requests and responses to add custom behavior. A plugin is a NodeJS Module that is placed in a specific directory that Insomnia knows about. The package.json must contain an insomnia attribute to be identified as a plugin. Take a look at the following file to see what a minimal package.json should look like. * won't recognize the module as a plugin. 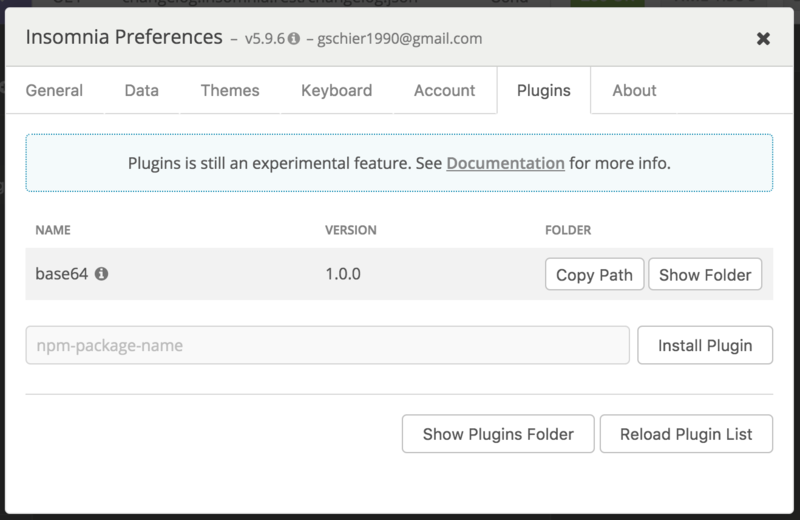 Plugins can be added from the Plugins tab within the application preferences dialog. They can also be downloaded and installed directly from npm. Here is a list of plugins available for installation via npm. XDebug – Enable Xdebug debugging by adding an XDEBUG_SESSION cookie to the request. 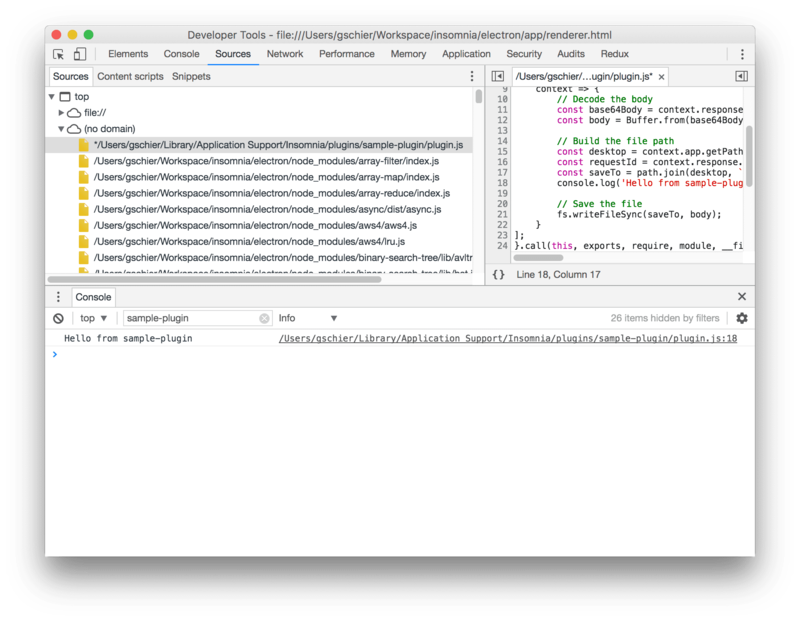 Navigate to View > Toggle DevTools to open the Chrome Developer Tools. From here, you can debug Insomnia as you would any web project in Chrome. If you want to focus specifically on the plugin you are developing, you can find it from the Sources tab and/or filter the Console based on the plugin’s file name. As mentioned, a custom Template Tag can be added, which can then be referenced inside Insomnia’s template system to render custom values. // called with the appropriate plugin API context. There are some shared API functions available to all hook types.